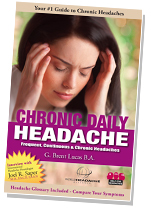 Our health charity, Help for Headaches, is making public the book Chronic Daily Headache. While the book is written for the headache sufferer, many health professionals will find it useful due to its relevant content and thorough research. Our goal is to provide patients with an educational tool, so that they may be better prepared for appointments with their physician. Chapter headings may be viewed here. processing and delivery. All sales are final.